Last weekend Justin and I went to Cincinnati to see Phish. Yep, Phish - that crazy hippie band. Though I think my days of three-day festivals are behind me, catching a show or two per tour is still a pretty good time. I started seeing Phish when I was 17 and now 15 years later, I'm enjoying the show just as much, probably more, than I did the first time. My attitude towards all those damn hippies has morphed from a strange fascination, to irritation to finally settling at a fine amusement. 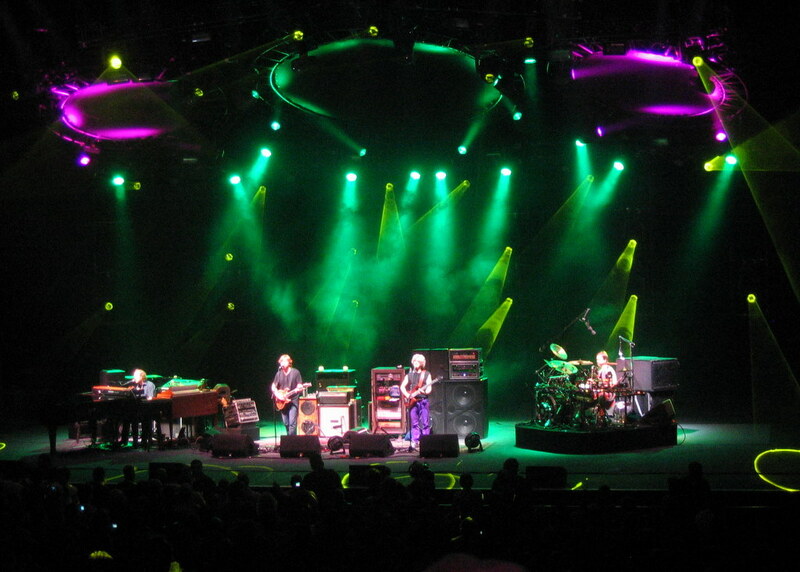 If you love to "people-watch", a Phish show is the place to go. I am almost as entertained by the fans and their antics as I am the band. Phish has the most entertaining fans in the world. From the nappy girl selling her burritos to the guy who spins in circles for three straight hours to the poor guy crying because his glow stick died, it is a festival of fools and I absolutely love it. We took off to Cincinnati - only Justin and I for a much needed break from real life. We found our break bar hopping on Saturday night and then dancing at the show on Sunday. In real life, I think parents often operate what I like to call a grocery-list marriage. When you have three kids, communication consists of what we need at the store, who needs to be taken where, who has to give the kids baths and who paid the cable bill. These are essential conversations, but they are mundane. At the end of the day, there really is no time to kick back, hang out and have a real good time. To be honest, when we took of for our mini-vacation, I was a little worried that we wouldn't have anything to talk about. Quickly, however, my fear faded as I remembered that we really do like and enjoy each others company. Justin and I have a really good time together. How easy that is to forget in the rigors of the day. So, thank you Phish. Thanks for bringing out all the crazies. Thanks for the marriage therapy. Thanks for playing Bathtub Gin. Thanks for everything - I had a damn good time.